Many talents have shown up this year at AW Awards ceremony, from top adult cam websites to the most beautiful models in the industry. 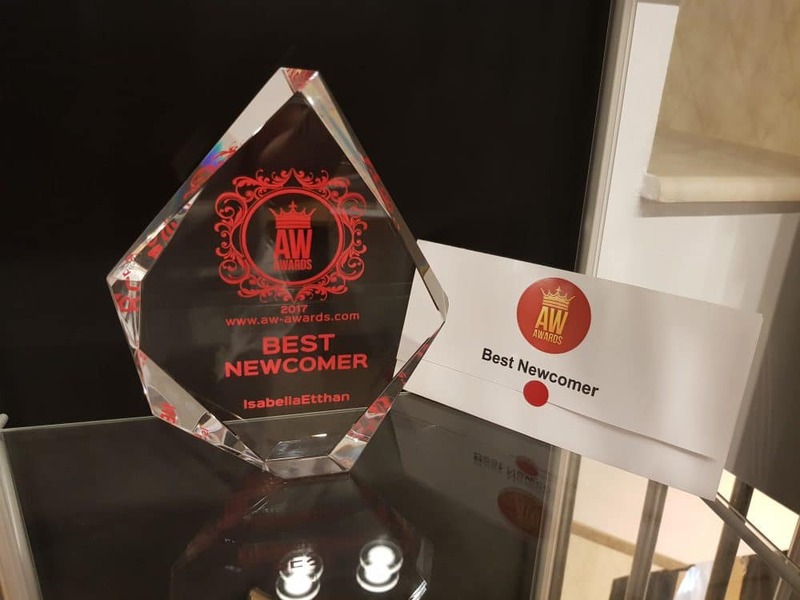 Today we will ask a few questions to someone that caught our eye with her beauty, the winner of the Best Newcomer award, Isabella Ethan. Isabella, how do you feel about this experience? Did you expect to win this important award? First of all, I would like to thank you all for this breathtaking ceremony. I was astonished to see so many people that I can relate to, regarding this industry. It’s a wonderful feeling to meet and talk to people you have so much in common with. It is my first experience of this kind and I feel very motivated to move forward with this industry, and become even better at what I do. What is your story? Why did you choose to be a video chat model? Well, I don’t like to speak about my past as I focus mainly on my future. But it all started when I was in college. My family couldn’t support my expenses anymore, and I had to choose a job, something that could support me through college. At first, I admit, it was all for the money. I was very attracted by the large income I would bank, and I started to enjoy this lifestyle. As the time passed by, I felt no more joy for the money I got. I was aiming to get better at my job, and like my manager said, I tried to aim for perfection. Getting this award, means a lot to me, and motivates me to continue down this path. I feel like I am closer to reaching my goals with every step I take. It still feels like a dream come true, and when I first heard about this award I almost passed out. Is it hard to become a model? What were your fears when you first started? Like every other job in this world, everything is hard at first. My biggest problem was that I was very shy on camera and I didn’t speak English very well. The amount of support I had from Live Studio helped me get through this quickly. I overcame my fear of the camera by practicing a lot. The studio also had very good English courses, that helped me learn the language in a few months. Then I realized, the only way you can get better is by improving yourself, your personality and character. By doing this every day, you can almost reach perfection. What advice would you give to a starting model? I will give them the advice I got from my manager: “Always try to improve yourself. Don’t think about what others say, and keep focusing on yourself. You are the most important person in your life and everything you do must make you happy.” He is the person I would like to thank the most for helping me. Listening to his advice, I shaped my personality in a way that I couldn’t do it myself. One more important advice for newcomer models is: Don’t try to be someone you aren’t. Even if the video chat industry is very similar to acting, being yourself can bring you the most benefits. We would like to thank Isabella Ethan for this interview, congratulate her for the Best Newcomer award and hope we will see her next year! Previous articleFlirt4Free’s Big Bang giveaway and contest starts on June 30th!